As I’ve mentioned, I absolutely refuse to buy this whole set online. However, seems it may be weeks to MONTHS before my stupid area gets them in, I needed someone from the team to hold me over, so I ‘yoinked’ Swindle from TFSource. Don’t worry, I’m going to do an official review, not just leave it at this crummy picture. I have him out of the box already and guarding my work desk, so I’ll get to this soon. He’s super yellow. There are rumors that Takara is going to be doing these guys as well. 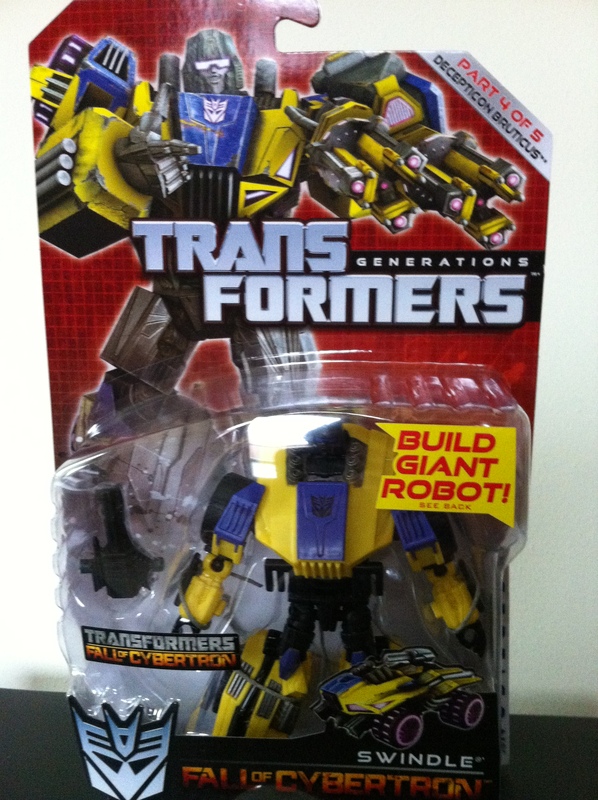 If their take on FOC Jazz is any indictation, it looks like I’ll be getting 5 versions of this mold. Is 5 too many? NO. No its not. If they do the Wreckers too…ugh..you know what, my wallet’s crying again, I gotta go buy it some ice cream. I still don’t know if I can get behind this line. FOC Jazz and Shockwave were such letdowns to me. Sure, there’s a large number of people disappointed. I really like all of them a lot, I understand that they’re not designed as well as some of the past figures, but given the world economy and the price or raw materials, I’m not going to fault Hasbro for it. I think they really are great toys. Its funny you say Shockwave, he’s widely considered the only one of the first three that anyone liked, but he is awfully small. They all are. Well, yes, that’s the argument. But Scale has always been useless with Transformer toys. Since when is Metroplex (G1) the same size and Shockwave (G1). So I tend to let size get away with some fluctuation. I always let G1 slide for some reason on scale. Metroplex should be bigger than Fort Max, after all. I think part of me felt a little cheated by the amount of the price increase compared to what I got size wise. When the G.I. Joes went from $5 to $8 or more, there was an insane increase in accessories, but not so with FOC. I’m sure I’ll get over it quickly once I get the Combaticons.